Analog: 2 hands (hour, minute (hands move every 20 seconds)). Accuracy: ±30 seconds per month. battery life: 10 years on CR2025. Full auto-calendar (to year 2099). Total weight: 49 g. Countdown range: 24 hours. Casio Men's Watch AEQ-110W. Condition is used. I have only worn this watch once for an hour but it’s not for me so moving it on. It cost me £23 from Amazon but I’ll sell it for £13 including postage so a nice big discount and it’s mint. Dispatched with Royal Mail 2nd Class. Premium Qality Best Price Hot sale Now. Pre-owned: Pulsar Alba Spoon by Seiko Space Age Watch W620-4330. Condition is Used. Watch has been in a drawer for a few years and the battery is dead. Sold as seen. some minor marks on the metal. I’ve tried to show them in the pics. Would benefit from a decent clean too. Dispatched with Royal Mail 1st Class. Casio Wave Ceptor Radio Controlled Digital Mens Wrist Watch WV58U1AV. Dual Signal Receiver. 12/24 hour format. 5 out of 5 stars - Casio Wave Ceptor Radio Controlled Digital Mens Wrist Watch WV58U1AV. 23 product ratings23 product ratings - Casio Wave Ceptor Radio Controlled Digital Mens Wrist Watch WV58U1AV. Analog: 2 hands (hour, minute (hands move every 20 seconds)). Accuracy: ±30 seconds per month. battery life: 10 years on CR2025. Case / bezel material: Resin. Size of case: 52.2 × 46.6 × 16.6 mm. Full auto-calendar (to year 2099). Casio Watch. [CASIO (CASIO) AE-1200WHB-1B?. AE1200WHB-1B world traveler watch]. CASIO EDIFICE. CASIO SHEEN. CASIO G-Shock. CASIO Baby-G. CASIO PRO-TREK. Casio Watch. CASIO EDIFICE. CASIO SHEEN. CASIO G-Shock. CASIO Baby-G. CASIO PRO-TREK. Casio Clock. CASIO introduces the new W-218H series, which is designed in a retro square case with a variety of color options, including black, blue, green X black, black X red, black X orange, and 5 colors. Accessories & Tackle. Casio Watch. CASIO EDIFICE. CASIO SHEEN. CASIO G-Shock. CASIO Baby-G. Casio Clock. CASIO PRO-TREK. Casio Watch. CASIO EDIFICE. CASIO SHEEN. 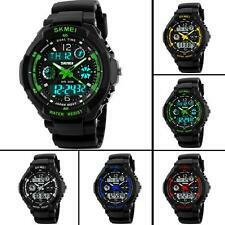 Japan Movt New Genuine Casio Watch Tough Solar 5 Alarms AQ-S810W-. CASIO G-Shock. CASIO Baby-G. Casio Clock. CASIO PRO-TREK. Accessories & Tackle. Function-wise, these watches link with the G-SHOCK Connected phone app to provide access to a number of functions that enhance your workouts. All of this combines to help you plan and record your workouts, making them more effective and enjoyable. Casio Watch. CASIO EDIFICE. CASIO SHEEN. CASIO G-Shock. CASIO Baby-G. CASIO PRO-TREK. Casio Clock. Night light stick. Used but in full working order,scuffed in middle of glass but can still see functions/time. TISSOT T-RACE TOUCH. -Scratch Free Sapphire Crystal. -Dial Colour- Black. 100% Genuine or Money Back. Pre-owned: Pulsar Alba Spoon by Seiko Space Age Men’s Watch W620-4330 A0. Silver. Casio Watch. CASIO EDIFICE. CASIO SHEEN. CASIO G-Shock. CASIO Baby-G. CASIO PRO-TREK. Casio Clock. The CASIO square digital watch introduces the new W-217H series. A Very Very Rare Ventura W12 Ltd Watch In New Condition. Being The Limited version this watch has the Classic Black Rotating Case. More pics to follow. Pre-owned: Diesel Only The Brave Men’s DZ7301. Black. Grey rubber strap. Watch ModelCasio G-shock Gulfmaster. Tide Graph Display. FeaturesTide graph, Stopwatch, Alarm. Shock Resistant. Button Sound on / off. Watch ShapeOval. PART NUMBER: GN-1000GB-1AER. Case depth approx.15.9mm. 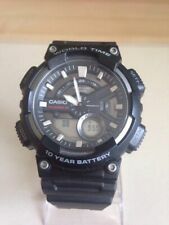 USED: Casio G- Shock Solar Sports watch. Solar powered. Resin watch body and strap. Mineral crystal. Case size 51mm. Case thickness 16mm. Watch is USED. Not worn much. 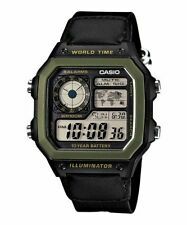 Casio G-Shock DW-6900MMA-1DR Watch Mirror Face Watch BN. Condition is New with tags. Dispatched with Royal Mail Signed For® 2nd Class. Reverse LCD and Red EL Back Light. Shock Resistant. Mud Resistant.5 Multi-Function Alarms. Twin Stopwatches.Dual Auto EL Backlight w/ Afterglow. Water resistant up to 660 feet (200 M). Stopwatch function - 1/100 sec. The watch has a maximum timing capacity of 100 minutes and can be set in cycles of 5 seconds. Accuracy: /- 30 sec seconds per month. LED light: A light-emitting diode (LED) is used to illuminate the watch face. NEW: Casio G- Shock Tough Solar Sports watch. Solar powered. Resin watch body and strap. Hardened crystal. Case size 52mm. Case thickness 15mm. Apologies : The outer box is a little tatty! Watch is NEW. NEW: Casio G- Shock Tough Solar Sports watch. Solar powered. Resin watch body and strap. Hardened crystal. Case size 52mm. Case thickness 15mm. Watch is new. This tough watch is ideal for outdoor use and will be of interest to military, police and security professionals. All these features and more make the G-Shock G-7710-1ER a good choice for a wide range of users including professionals but also for hiking, training, airsoft and much more. Display type: Analog. Dial window material type: Mineral. Dial color: Blue. 39 mm stainless steel case with mineral dial window. Band material: Stainless steel. Case material: Stainless steel. Stainless steel link bracelet featuring foldover clasp with double push-button safety. Casio Wave Ceptor. This is a Casio digital wave ceptor watch. The watch features We get great deals direct from the manufacturer and pass the savings straight onto you. As when you buy from us, you are buying from a qualified jewellers, with more than 30 years of experience in the industry. Police Grey Cyberlite Digital Watch Brand New Tagged Boxed & with Papers. Loads of life in the battery so no problem there as well. STUNNING Fashion Quality watch for the money and with Digital watches back in fashion now in the very cool Grey as well. CONDITION: in Mint Condition. Big Digit Talking Watch by Lifemax. From our Lifemax range of talking watches, our big digit talking watch gives you robust build quality at a rock bottom price. Lifemax Talking Watches, the experts choice. Round high-performance and durable resin case with analogue - digital display. Includes alarm, stop watch and back light. Shatter-resistant acrylic window lens. Durable and strong resin 15mm wide strap with buckle. Indiglo Night Light. 100 hour Chronograph with Lap and Split. 99 Lap counter. 2 Year Warranty. 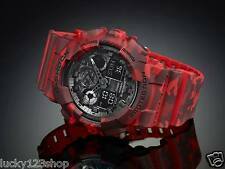 PART NUMBER: GGR-8900-1ER The solar powered GR8900, a new large case digital series from G-Shock. Black resin band digital watch with a black face. Full Auto LED Backlight (Super Illuminator) with Afterglow. Tough solar enables the wearer to use multiple functions simultaneously without adversely affecting power storage cell. Buckle clasp. Grey dial. No user manual/Operation Guide is supplied but it can be downloaded from manufacturer's website. Source: Genuine. Model: W-42H. Case colour: Silver. Clasp type: Strap buckle. COLOUR: YELLOW. Strap colour: YELLOW. Water resistance: 100M. Approx case depth: 13mm. Strap type: Rubber. Case material: Resin. If you are searching for an accessory with ultimate precision, select an oval digital men's watch. Thanks to their functional and stylish displays, you can pair them with any outfit. These digital watches are generally built with backlighting, so you can easily see the time in poor lighting conditions. Bolder than other styles, they are often designed with bigger faces. They have highly popular styles and traditional shapes, which will forever be in fashion. Solid gold bands are resistant to corrosion, so these watches will look like new for seasons to come. Entirely made of gold, the bands are highly precious and luxurious. Hook and loop band wristwatches have flexible bands for an extremely comfortable, less restrictive fit. Both durable and versatile, they are perfect for anyone with a more active lifestyle. Stainless steel case wristwatches have a modern style, which is perfect for when you're looking to update your watch collection. Built with scratch-resistant designs, they are less likely to get damaged by any accidental drops. With traditional styles, platinum case watches are versatile accessories that you can wear whether you're enjoying a day at home or a night on the town. Platinum is a precious material, giving these timepieces additional value. Hand-wound mechanical watches are a popular choice for anyone who enjoys the motion of manually winding their timepiece. They tend to have thinner profiles for a sleeker appearance. With their classic design, quartz movement wristwatches will be wonderful additions to any jewellery collection. The movements are renowned for their accuracy and precision, making these watches exceptionally reliable. What are some of the most purchased oval digital men's wristwatches on ebay?